Well, it finally happened. I dug my fluffy winter coat out of storage yesterday. Alas and alack; it’s cold in Michiganland. I know this weather is nothing compared to what I can look forward to in December, but I’m waving the white flag on sandals, short sleeves, and coatless workdays. The cool fall air signifies the end of a lot of things: corn harvest, watering the grass, suntans, dinner on the deck, shaving my legs. It also signifies that I absolutely must fill you in on the corn-ish happenings around the farm in the last month or so. Step 2: Bring in the harvester and chop! that! corn! My Dairy Man gets in around midnight each night during corn harvest. Between you and me, I don’t even notice anymore. During my first corn harvest, I would abruptly spring into consciousness as soon as the DM got home. This year—my third corn harvest—I found it startlingly easy to go (and stay) asleep without the husband next to me. Some call it bad wife-ery, I call it a coping mechanism. After over two years of marriage in the shadow of farming, I’ve gotten pretty good at sleeping through late nights, 3 a.m. phone calls, and power outages. As for the Dairy Man? He entered a zombie-like state somewhere in the second week of harvest and didn’t snap out of it until late September. Imagine that last part being as exciting as “move! that! bus!” It’s Extreme Home Makeover: Cornfield Edition. Each year we hire an outside company to chop our corn. Max the friendly chopper and his intrepid crew drive a machine called a harvester through the fields. 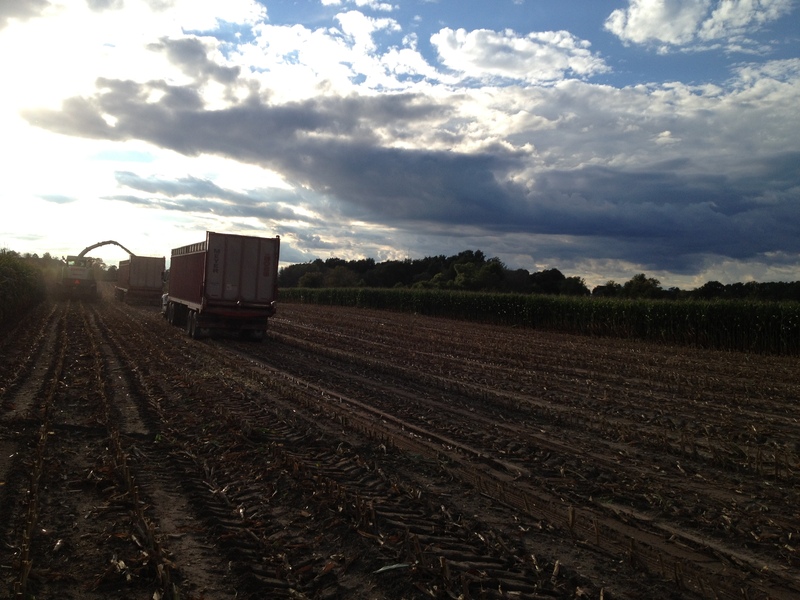 Trucks follow along to collect the chopped corn. A forage harvester (a.k.a. silage harvester, forager, or chopper) chops the entire corn plant into silage. Corn silage is just a fancy way to say “chopped up corn.” And I realized this year that a lot of farmers put silAGE into a siLO. Whoa. Do you think that’s where the word “silo” came from? I think yes. Silage in the silo. Don’t underestimate the gravity of this realization. When I finally figured it out, you would think I had invented butter. It was like the day I realized cows give milk because they’d just had a calf. Earth-shattering stuff. Anyway. The chopper mows down the corn and blows the silage into trucks. 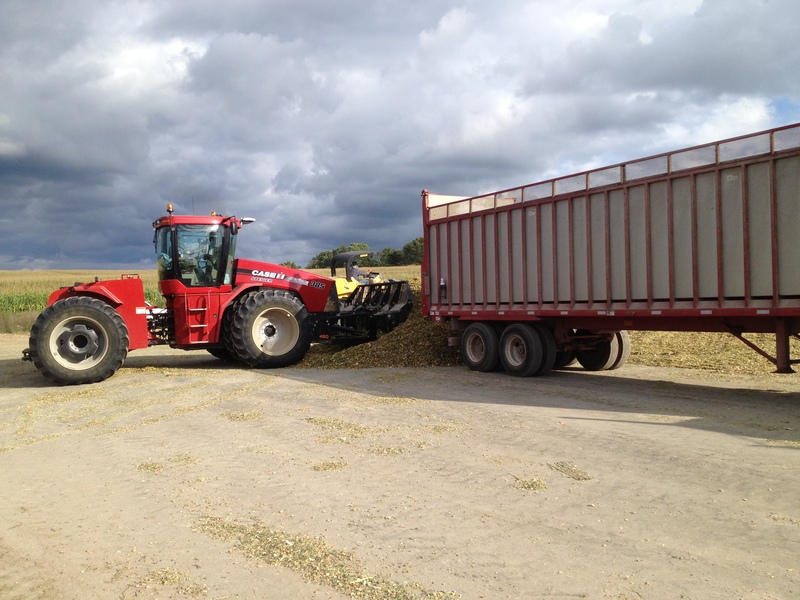 The trucks drive from the field to the dairy and dump the silage on the PACK. 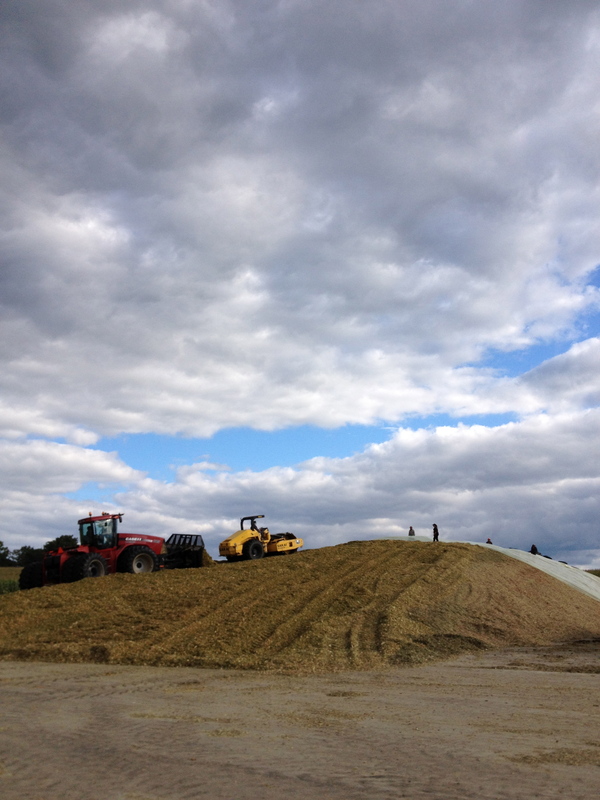 After the trucks dump their loads of silage, tractors are waiting to push the piles up the pack (how’s that for alliteration?). 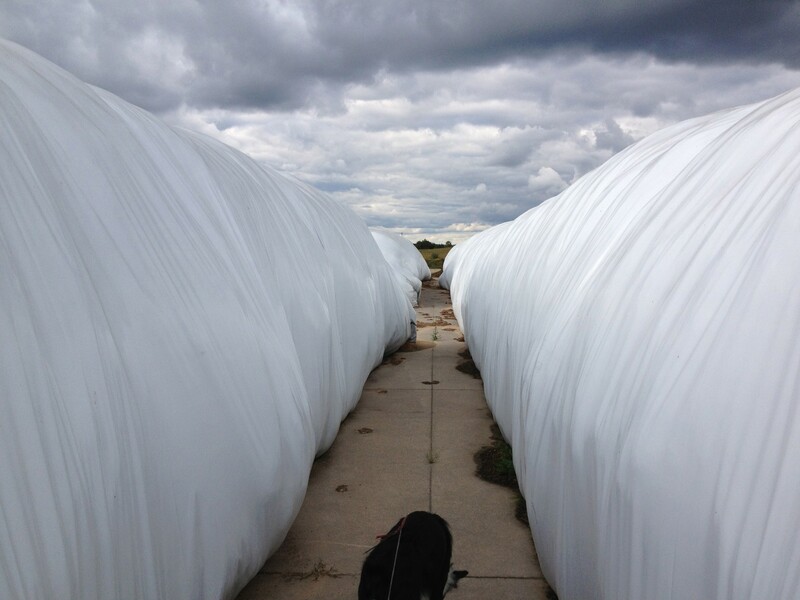 We squirrel away corn silage in two ways: giant packs and tubular ag bags. Ag bags are easier to seal and maintain; packs are more space efficient. This year we put up two large packs AND filled a bunch of ag bags. We like to keep things interesting. 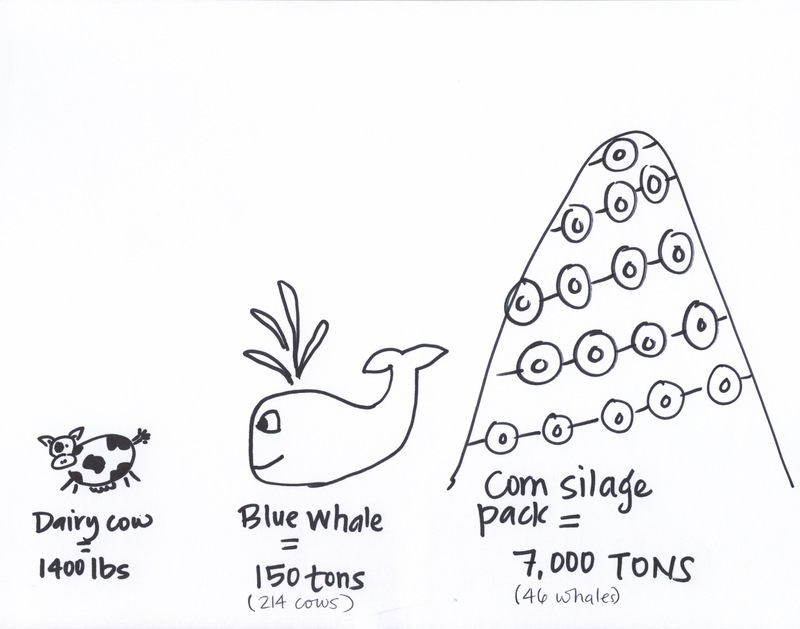 Last year I explained the process of packing corn silage. 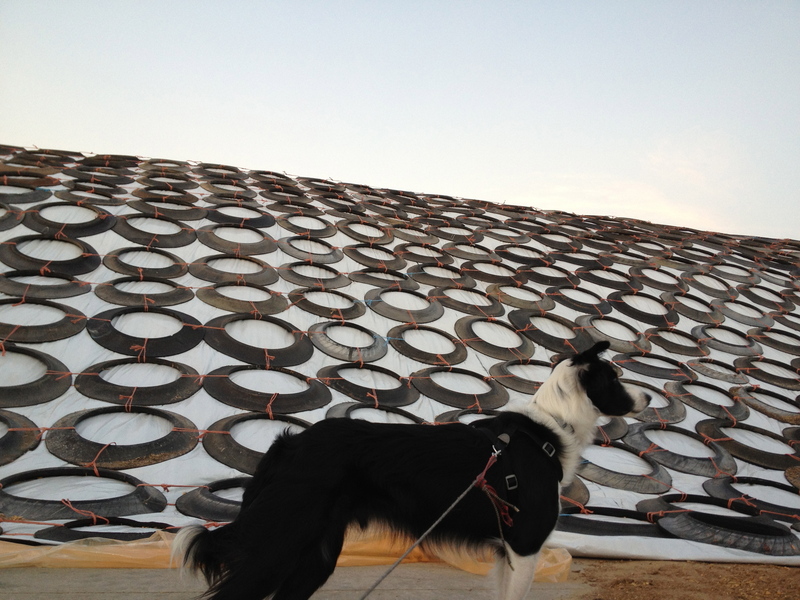 Each pack this year contains almost 7,000 tons of silage and took approximately a week to build, compress, and cover. 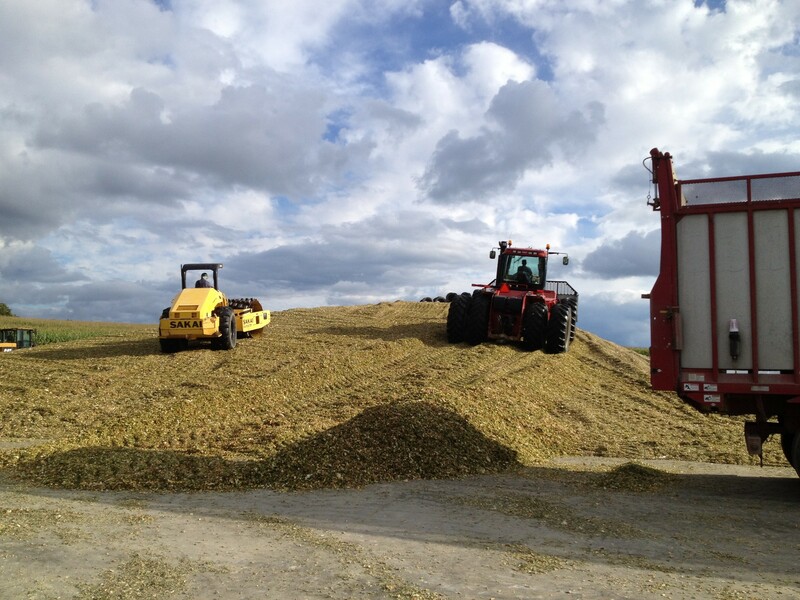 Corn silage from harvest 2012 will feed our bovine ladies for the next year. And parents complain about the cost of feeding their kids. Geeze. You can’t buy Canned Cow Corn at Costco. 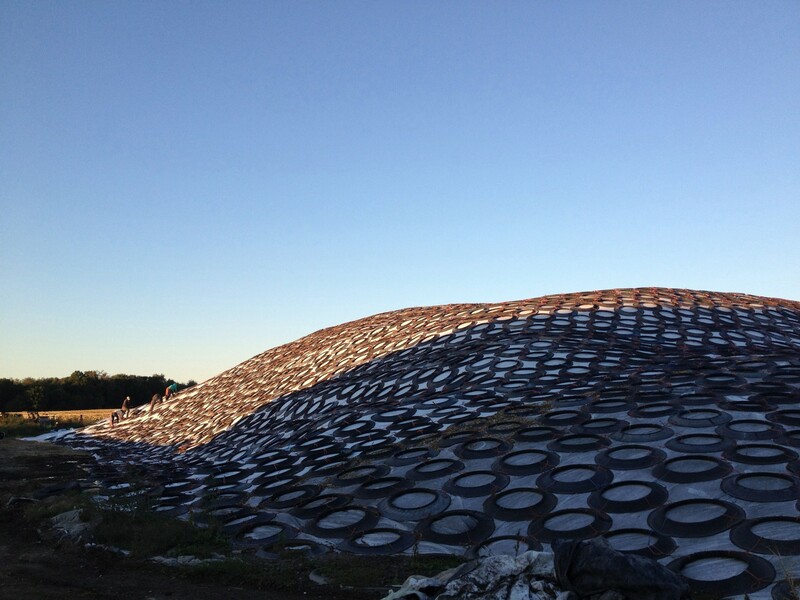 After a pack is built and compacted, we cover the entire monstrosity with huge pieces of thick plastic and thousands of sliced tires. 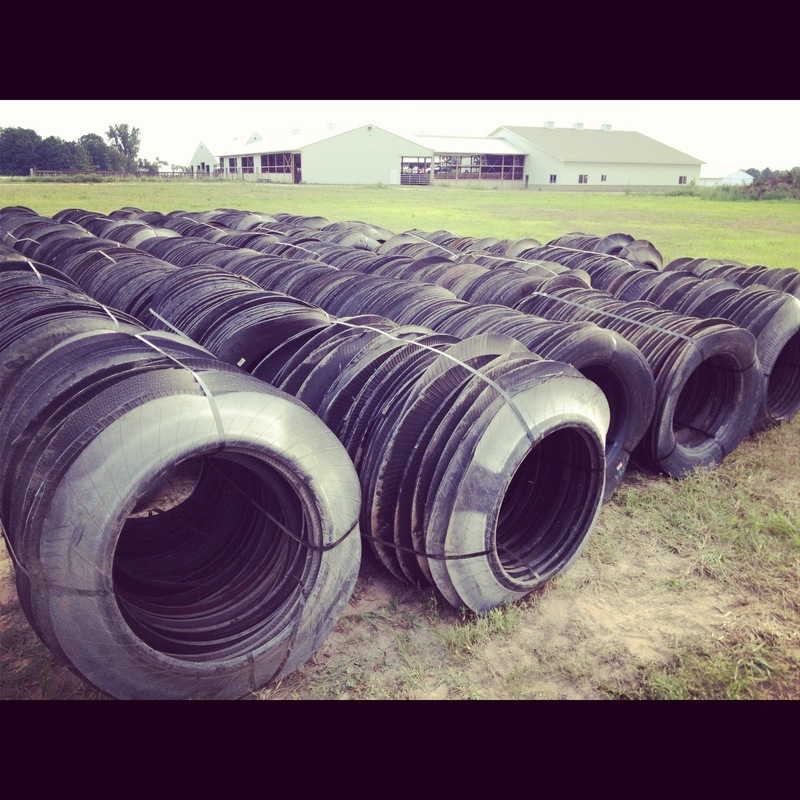 The tires hold the plastic down and ensure that no moisture or oxygen gets into the pile. They also serve as stepping stones if certain modern farm wives decide to climb to the top of the pack. King of the mountain, anyone? Just don’t fall into the manure pit. We will uncover the pack bit by bit over the next year to feed our ladies. This step is currently in process on our dairy. A few fields have purposefully remained unscathed during Corn Chop 2012. The corn stalks in these fields are left to completely dry out and the Dairy Man goes through a few weeks later to harvest shelled corn. 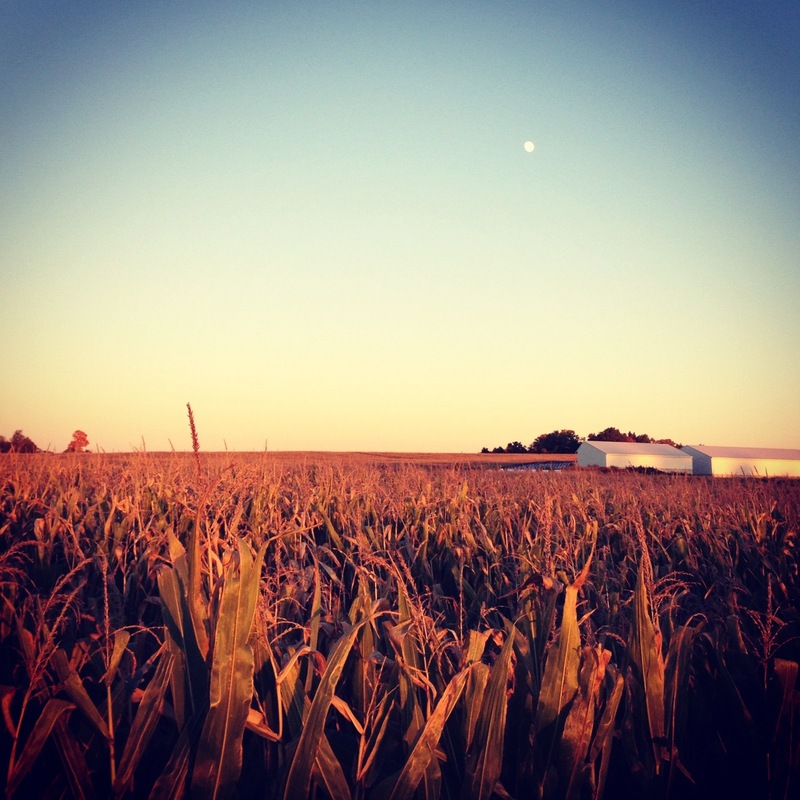 While corn silage is comprised of the entire corn plant, shelled corn is just the kernels. 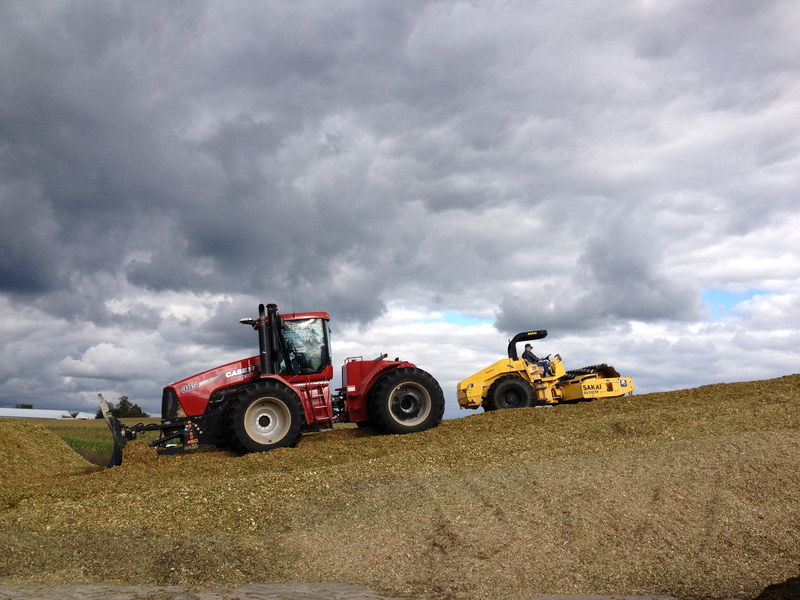 Both silage and shells are used in our feed rations. And both types get tracked into my house on DM’s boots. I promise to drop some thrilling shelled-corn-knowledge on you in my next post. BAM. 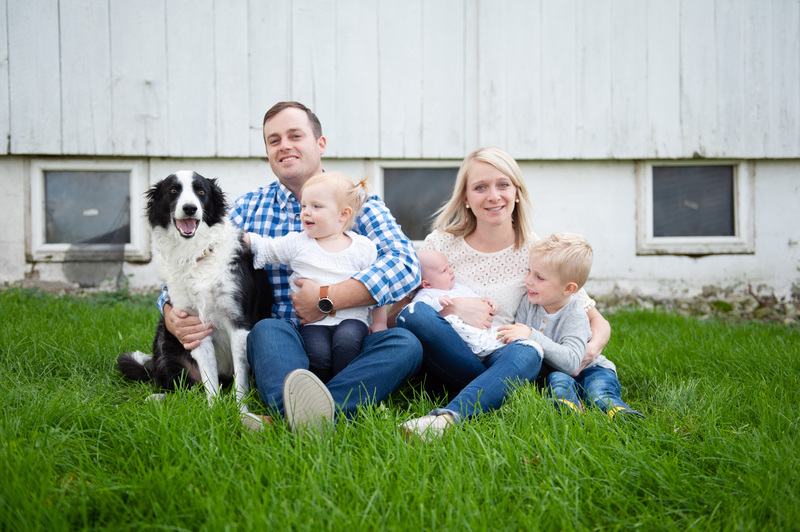 When the corn is harvested, the cover crops are planted, and all of the cows are starting to grow their furry winter coats, reacquaint yourself with family, friends, and puppies. At long last, my Dairy Man will slip into hibernation. Winter is almost here. Love the corn harvest explanation! You do a great job. Keep it up! What a job! I would love to watch it being harvested. 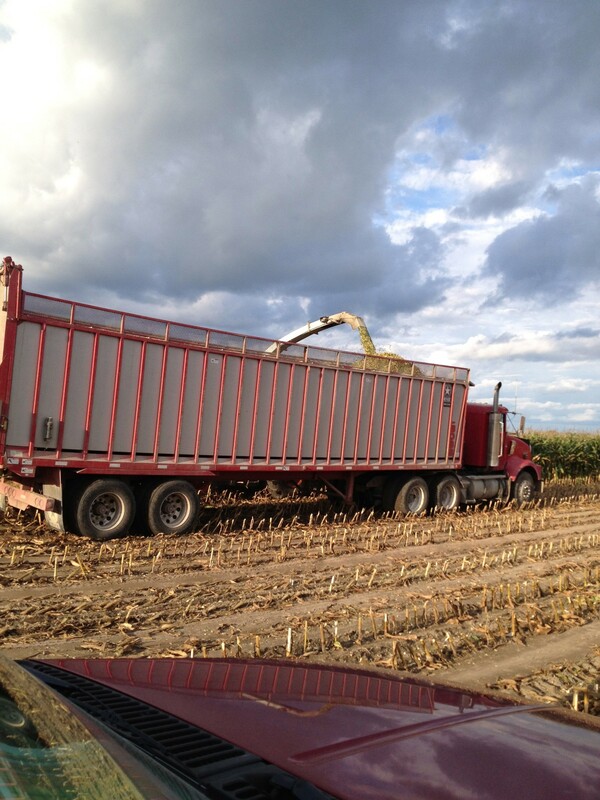 How many acres of corn do you silage and shell? It really is quite a process! 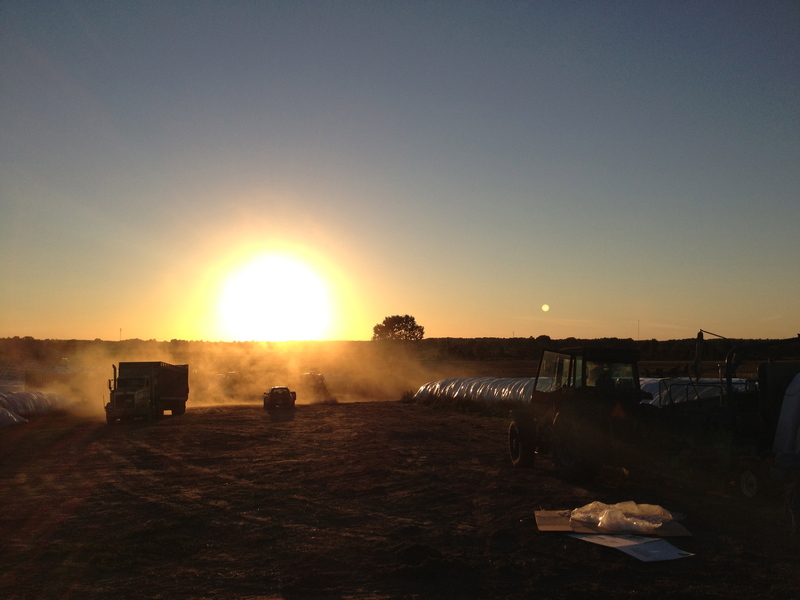 Between silage and shelling, we farm a little over 1,000 acres. Phew! I love reading this. 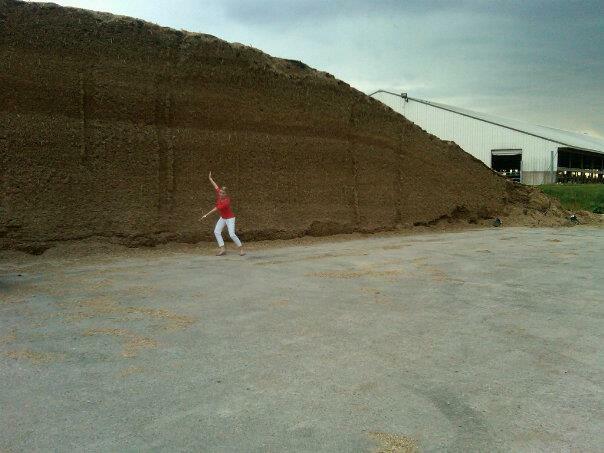 We have a dairy farm, but our silage pile is no where near that big! We only milk 90 cows! Thanks, Courtney! 90 cows is nothing to sniff at. I’ve found that they all require a lot more feed than you’d think! Love this blog! I live on a farm, but don’t have any dairy cows (pigs, steers, & crops). When I’m home from college, I help a farm out by me that has dairy cows… I love helping them. Living on the farm is the greatest experience ever! Thank you, Ella! And surprisingly, I’m starting to agree – farm life can be a lot of fun!